So, I got myself an NHM90 in .223. Hold you applause. The only mags available are 5 rounders, and after some googling it looks like there is a way to convert them to seven rounds. In America they would trim about 1 inch off the follower to make them in to 10 rounders, so by my ghetto mathemications I need to trim 5mm off mine to make a 7 rounder, which is roughly where the scissors are in the photo. Does this compute? Have I missed or screwed up something obvious? Any tips or "don't do it dipshit" words of encouragement? Apparently all of the seven round 7.62x39 magazine available for x39 NHM90s were all factory converted from 5 rounderes this way. If someone here has a 7 round x39 mag they want to disassemble and take a photo of for me as a guide that would be great. Pretty sure I also need to trim a bit off the plastic thing sticking up at the bottom. 40mm, Cordite and Max Headroom like this. As above, take small bits. Likely you'll have it apart and back together quite a few times before you're happy. As the others have said, go slow and under-trim rather than over-trim. It'll be useful and the best if you can shoot the mag between trims to see if it cycles and feeds properly. 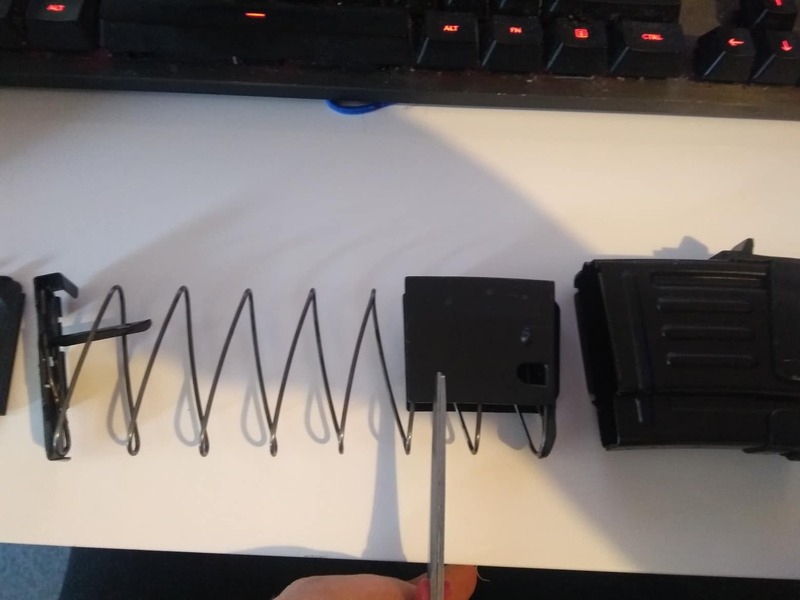 Don't touch/stretch your mag spring when you trim so you can limit your possibility of error. Anyone converted 5 round SKS "standard" mags to 7 round? No, and I have tried. If you want a seven rounder you have to find an SKS with the original military magazine that someone converted to seven rounds here in NZ when the law changed. I had one from GC that would take 7. It was sold as a 5. It mis-fed a lot if you had 7 in though. Ran sweet with 5.